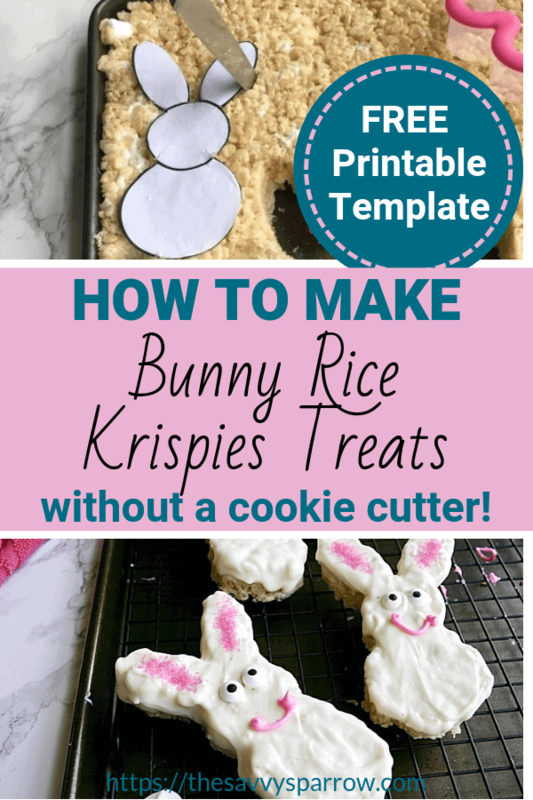 Want to make bunny Rice Krispies treats for kids, but don’t have a bunny-shaped cookie cutter? Have no fear! Find out how to make these delicious Easter bunny Rice Krispies treats without a cookie cutter! So, I have to give my husband the culinary credit (again!). These adorable bunny Rice Krispies treats were his idea. We have a whole drawerful of sprinkles left over from both of our daughters’ birthday parties. So, when I told him I wanted him to make some Rice Krispies treats for Easter, he suggested that we use the pink sanding sugar to fill in the ears for our cute bunny Rice Krispies treats. The only problem was, we didn’t have a bunny cookie cutter. So I scoured Kroger, Michael’s, and Hobby Lobby, but I still couldn’t find a bunny-shaped cutter that I liked. The ears on all of them were just too short or too narrow to use for his genius pink sugar idea. So, we tried a paper template. After all, that’s what parenting/baking/cooking/crafting/life is all about, right? Trial and error. And this trial was a dang success! We used a bunny template that I already had from when I made my cute DIY Easter banners. (You can print the bunny template HERE). 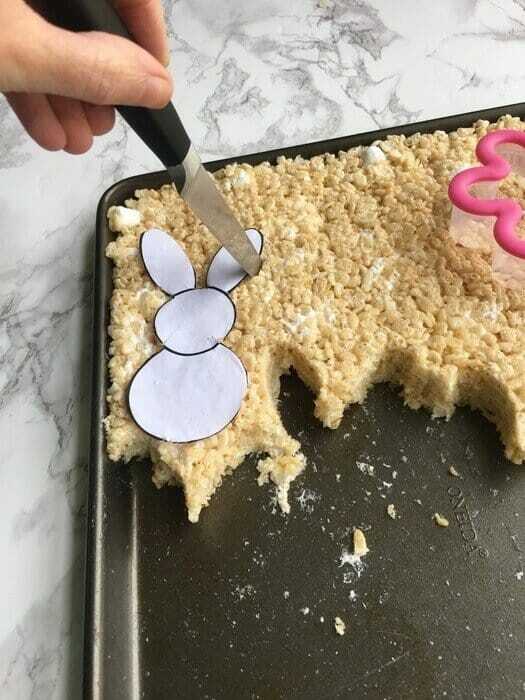 Just cut out the bunny shape, press it onto the top of your Rice Krispies treats, and use a pairing knife to carefully cut around the edges. After you are done cutting, carefully take the bunny out. We found that it was easiest to gently tear away the treats from around the bunny. 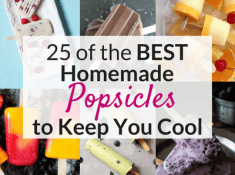 Then, use your fingers to gently shape any jagged edges. 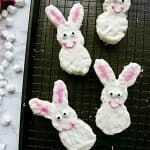 Dip the bunnies in melted white candy melt chips, decorate, and you’re done! These delicious bunny Rice Krispies treats are almost too cute to eat! 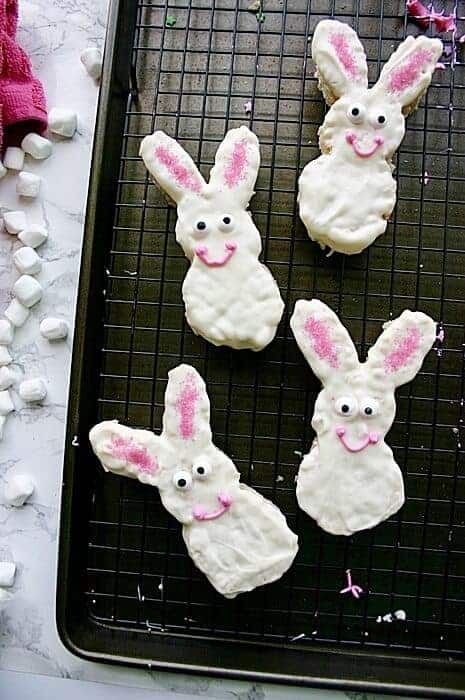 Make this fun Easter treat for your Easter dessert for kids, or bring these cute treats to your child’s Easter school party. 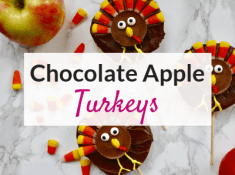 No need for a bunny cookie cutter! Heat one stick butter in a large non-stick saucepan over medium low heat until melted. Mix in one and a half bags of mini marshmallows and vanilla extract. Continue to mix until marshmallows are melted. Pour entire box of Rice Krispies and remaining half bag of marshmallows into a large bowl and toss. Pour marshmallow/butter mixture over Rice Krispies and carefully fold until combined. 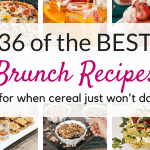 Spread mixture onto a large sheet pan (ours is 11″ x 17″) and press down to flatten. 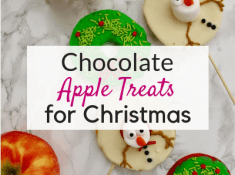 Treats will be sticky, so use a rubber spatula to flatten, or cover with plastic wrap to flatten. 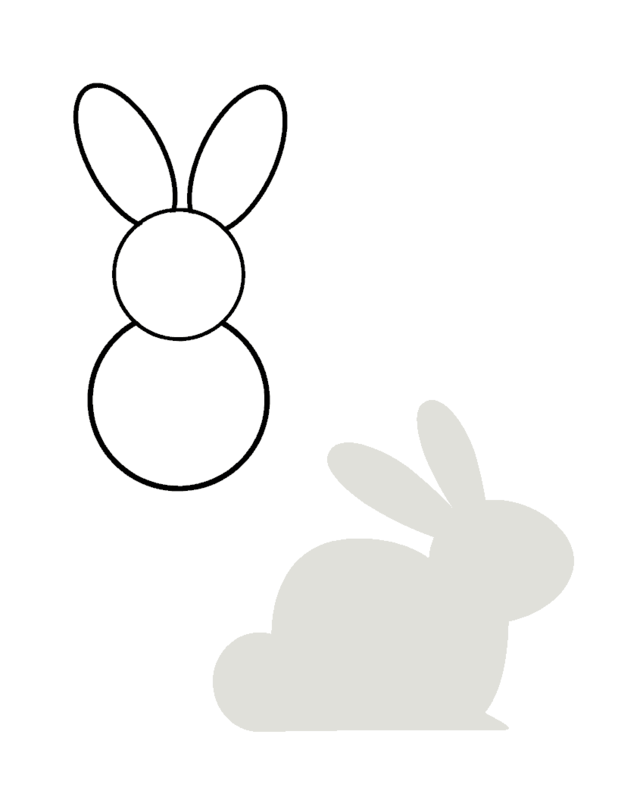 Cut out bunny shapes using the template or cookie cutter. Melt white candy melts in a large bowl according to package instructions. Dip one side of bunny treats into melted candy. While still wet, sprinkle pink sugar onto insides of ears, and apply candy eyeballs. 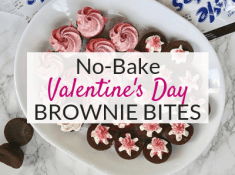 Once dry, use pink icing to pipe on a smile.